L’Escalade is Geneva’s top family-friendly festivals and overshadows other Advent events and Christmas markets in mid-December. L’Escalade is the top event in Geneva’s festival calendar. L’Escalade is celebrated each year over a weekend in mid-December with parades, demonstrations, music, cannon fire, loads of chocolate, vegetable soup, and warm wine (vin chaud) – much of it is free. 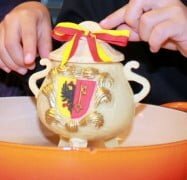 L’Escalade is a great family festival with many events for children, although older Genevois tend to thoroughly enjoy it too! Why is l’Escalade Celebrated in Geneva each December? L’Escalade commemorates the only memorable date in Geneva’s history. Forget about John Calvin, the foundation of the Red Cross, the ill-fated League of Nations, and the countless international organizations and diplomatic events hosted by Geneva during the past century or so. All fine institutions and often important events in their own right but the only date that counts in Genevan history is December 12, 1602. Early morning, December 12, 1602, the dastardly troops of the Duke of Savoy tried to attack the free city of Genève by stealth. The plan was to scale Geneva’s town walls quietly with the help of long ladders and then open the city gates for more troops to pour into Geneva. Escalade is used both in English and French to describe the form of attack where enemy combatants try to scale fortified walls by ladder. However, the Savoyards were spotted, the alarm raised, and a battle ensued, which ended in a famous victory for Genève. Duke Charles Emmanuel had to admit defeat and in the Peace of St Julien had to acknowledge the independence of the Republic of Geneva. What is Celebrated in Genève’s l’Escalade Festival? Genevans celebrate l’Escalade with music, cannon fire, battle reenactments, cultural events, marches, parades, and loads of food and drink. Dressing up in period costume is done by old and young. Pensioners reenact battles, children parade through the town with drums and flutes, and the streets are patrolled on horseback. Almost all events are free and even mulled wine and chocolates are dished out for free at some events. Collections are held for charities but very few events or venues charge admission during L’Escalade. 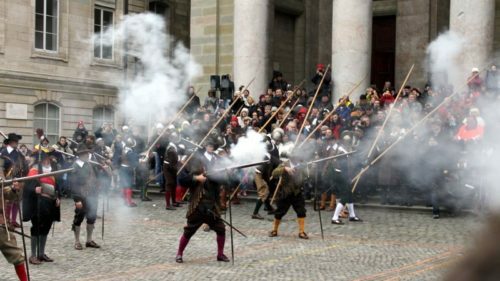 Events are staged throughout the old town of Geneva with reenactments in front of the cathedral in the Court of St Pierre. Cannons and musket (mousquettes) fire provides some noise and further events are staged at the Treille Bastion, where the main attack took place. A special event is walking the Passage de Monetier – the narrowest passageway in Geneva. It is on private property and generally only accessible during the Escalade weekend. Admission is free and free mulled wine is usually offered at the exit. Marmite is a registered trademark known to all British residents. Marmite is French (and English too) for a large covered pot or cauldron – doubters may check the drawing on any Marmite ® bottle. However, more popular is the breaking of the chocolate marmite. From November onwards, chocolate marmites are sold in all Genevan supermarkets and chocolatiers. These marmites are filled with marzipan vegetables and decorated with the red-and-yellow colors of Geneva. The youngest and oldest members of the family traditionally smash the marmite and then all is consumed. Migros, one of Switzerland’s large supermarket chains, sells marmites ranging in size from an individual-portion of 60 g (CHF4.50) to an extended-family-and-friendly-neighbors-are-invited-too 3 kg monster (CHF220). Chocolatiers make even larger ones for special societies and celebrations. Despite the focus on chocolate and mulled wine, the original escalade actually had more historical and strategic significance than it is often credit with. The free city of Geneva was a Calvinist protestant bastion surrounded by Roman Catholic Savoy – this was probably the main reason for the original attack. Rich protestants felt save in Genève, which contributed to the development of Geneva’s banks and influence on financial matters in Europe. Tourist information offices and most hotels will have brochures with the events and maps of l’Escalade events. Christmas Markets on Lake Geneva – unfortunately, Geneva’s International Christmas Market is a bit disappointing after the excitement and exuberance of l’Escalade. Jumping on a train to Montreux or the German-speaking parts of Switzerland is more rewarding.